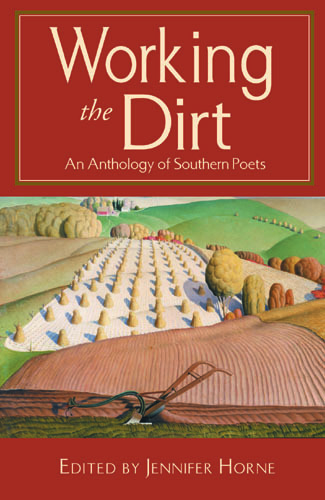 A loamy volume of verse thematically inspired, Working the Dirt celebrates Southerners' connections to the land. The selected poems share themes of gardening, farming, and the rich Southern soil. The approximately one hundred poets, known and lesser known, living and dead, include: Fred Chappell, Walter McDonald, A. R. Ammons, Robert Morgan, Wendell Berry, Henry Taylor, Tom Dent, Jesse Stuart, Jim Wayne Miller, Ellen Bryant Voigt, Marion Montgomery, James Whitehead, C. D. Wright, George Scarbrough, Ahmos Zu-Bolton II, Thad Stem, Jr., William Sprunt, Donald Justice, Thomas Rabbitt, James Dickey, Rick Lott, John Allison, Edwin Godsey, Richard Jackson, Nikki Giovanni, Alvin Aubert, Margaret Walker, Emily Hiestand, Robert Gibbons, John Stone, Coppie Green, Bonnie Roberts, Coleman Barks, Anne George, Edward Eaton, Margaret Gibson, Naomi Shihab Nye, Jack Butler, R. H. W. Dillard, Jane Gentry, Rodney Jones, Dannye Romine, Miller Williams, George Garrett, Sandra Agricola, Patricia Hooper, Gerald Berrax, Gibbons Ruark, Catherine Savage Brosman, Loretta Cobb, and Pattiann Rogers.